Many members of Keating Chambers have considerable expertise in technical marine engineering matters, and have advised and acted in numerous international shipbuilding and offshore construction disputes. The nature of such disputes is wide-ranging, encompassing delayed delivery and defects claims, actions for delivery up, calls on bonds, liens, arrests and related insurance and professional negligence matters. Hand in hand with construction disputes, we are increasingly instructed in relation to operational matters, for example delayed drilling operations, dredging disputes, land reclamation and hydrocarbon extraction. Our experience extends to many types of vessels, from cargo tankers to super yachts. Members work regularly on disputes relating to vessels destined for the oil and gas industries such as FPSOs and jack-ups, semi-subs and drillships. Other cases members have been involved in include dredgers, cable laying barges, military personnel carriers and regular ferries. We also have “noteworthy expertise in claims relating to offshore wind farms” and lead the field in the recent proliferation of disputes concerning their construction and operation. Members are well-regarded advocates in the Commercial Court and TCC, but also under the major arbitral regimes such as LMAA and LCIA. Our practitioners understand “the dynamics of the offshore construction arena” and have appeared in the most notable cases of recent years, including Adyard Abu Dhabi v SDS Marine Services  BLR 384, 136 Con LR 190, (2011) 27 Const. LJ 594, Bluewater Energy Services BV v Mercon Steel Structures BV and others  EWHC 2132 (TCC); 155 Con. L.R. 85, Transocean Drilling UK Ltd v Providence Resources plc  EWHC 4260 (COMM) and MT Hojgaard A/S v E.ON Climate and Renewables UK Robin Rigg East Ltd  BLR 450,  EWHC 1088 (TCC) and  UKSC 59 BLR 477. The international aspect of this work means that members have acted for or against many of the major shipyards across the globe. We also have experience of acting directly with owners and yards as well as accepting instructions in the traditional manner, and are often involved in the very early stages of the dispute when tactical and commercial considerations concerning claims, rights and remedies, and termination are paramount. Our shipping expertise is recognised by The Legal 500, who praise members for their commercial approach to disputes. 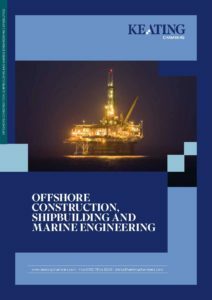 Our experience and expertise in this field has led to the publication of the pre-eminent textbook in the field, Keating on Offshore Construction and Marine Engineering.